Programmatic advertising – a transformative technology that is all set to revolutionize the Indian digital advertising scenario, is gradually making its presence felt in India. The India chapter has begun only a few years back, and has shown a remarkable promise for the advertisers and publishers alike. 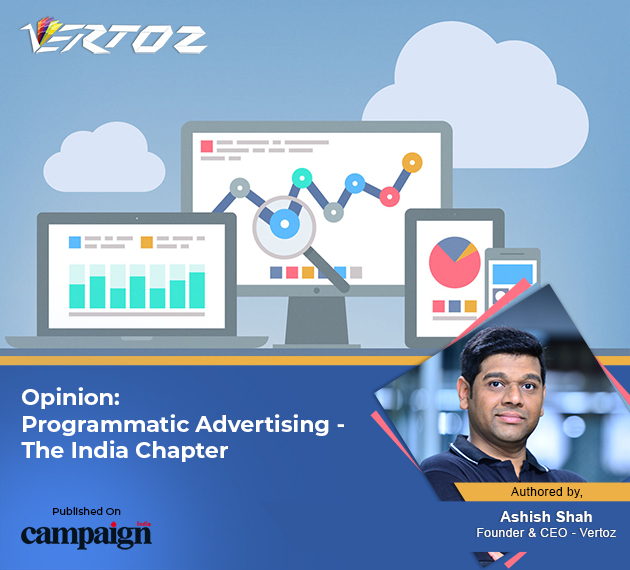 Vertoz’s Founder & CEO, Ashish Shah, recently shared his views on the rise of programmatic advertising and how it is changing the face of advertising in India. Ashish says this change can be attributed to a number of reasons. Firstly, programmatic advertising has already proven its mettle in the western countries like the USA and the UK. It has taken over traditional media there and the advertising industry in the West is already reaping its benefits. The great heights they have been able to scale by implementing programmatic techniques, is a testimony to the growth potential of programmatic advertising in India. Secondly, India is already on the cusp of digitalization. Thus, the timing couldn’t better for programmatic. Add to it the increasing smartphone and internet penetration in rural areas, thanks to which, more and more people are getting online and can now access the internet on-the-go. The major attraction, though, is its unique targeting capabilities. Programmatic advertising allows advertisers to have niche targeting like demographic targeting, geo-targeting, targeting on the basis of device and device ID, O.S. and O.S. version, browser and browser version, and the list goes on! What’s more, it even enables the implementation of advanced techniques like Dynamic Creative Optimisation (DCO) using which one can dynamically create personalised ads based on the viewer’s run-time data. The nest part about programmatic advertising is that it makes decisions purely based on data. It employs advanced technologies like Artificial Intelligence (AI) and Machine Learning (ML) to analyze huge sets of data and derive valuable insights from it, which is not possible for humans. All this translates into a high ROI for the advertisers and publishers. With such amazing and unique benefits, no wonder that programmatic advertising is catching-up fast. It is now a must-have for every player in the ecosystem, if they wish to stay in the game for long.